Galle’s works formed part of the permanent collections of the museums of Antwerp, Bordeaux, Boulogne-sur-mer, Bruges, Brussels, Cambrai, Florence, The Hague, Karlsruhe, Maastricht, Prague, Tourcoing and Valenciennes among others. 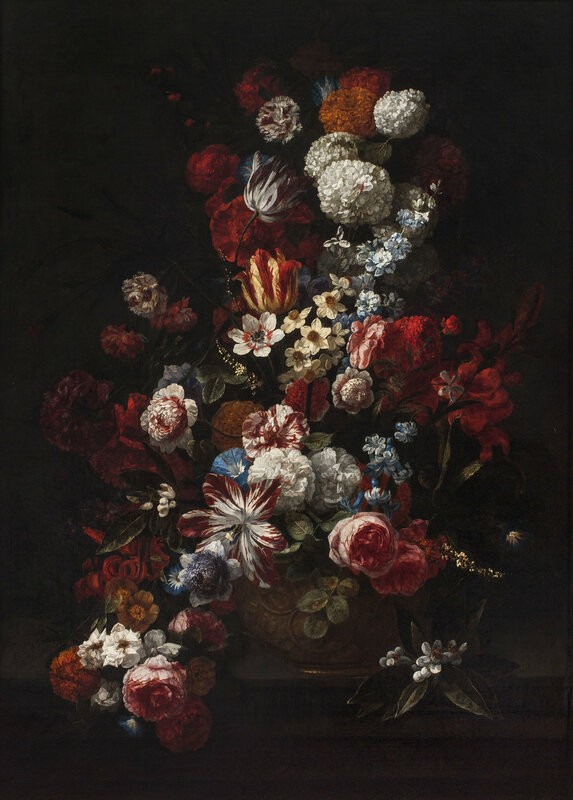 We are grateful to Fred G. Meijer for confirming the painting as a work by Hieronymus Galle the Elder. Biographical information taken from Dr. Ulrich Thieme and Dr. Felix Becker, “Heironymus Galle I” in Allgemeines Lexikon den Bildenden Künstler, Veb E.A. Seeman Verlag, Leipzig, Volume XIII, 1920, p. 108, and Adriaan van der Willgen and Fred G. Meijer, “Hieronymus (I) Galle” in A Dictionary of Dutch and Flemish Still Life Painters Working in Oils, 1525-1725, Primavera Press, Leiden, 2003, p. 87. Abigail D. Newman, “Hieronymus (I) Galle” in Reclaimed, Paintings from the Collection of Jacques Goudstikker, Bruce Museum, Greenwich, Connecticut, Yale University Press, New Haven, 2008, p. 228. Walther Bernt, “Hieronymus Galle” in The Netherlandish Painters of the Seventeenth Century, Volume I, Phaidon, New York, 1970, p. 41. Abigail D. Newman, op. cit., p. 228. “Jean-Baptiste Monnoyer” on Thyssen-Bornemisza Museum website at museothyssen.org/en/thyssen.